NEWS ANALYSIS: As if leading annual state budget negotiations wasn’t demanding enough, Prime Minister Erna Solberg had to do so this week while her own offensive justice minister, Sylvi Listhaug, was blatantly challenging her authority. At stake is public confidence in top Norwegian politicians and the government coalition itself, just as Solberg also faces some of the harshest criticism directed at her personally during her time as Norway’s top political leader. 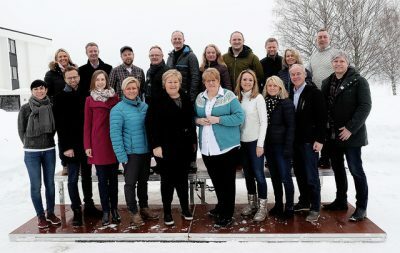 Solberg assembled her ministers in Hurdal on Monday, all of them unusually casually dressed as they gathered for a group photo in wintry weather. The chill was likely to follow them indoors, since several are now openly at odds with one another and geared for a fight that involves more than just how much state funding each will try to secure for their ministries next year. At the center of the trouble that’s broken out within Solberg’s Conservatives-led coalition is the Progress Party’s Listhaug, who once again has managed to inflame not only the opposition in Parliament but government colleagues as well. Political commentators discussing the current uproar on NRK’s radio program Politisk kvarter Tuesday morning all agreed that Listhaug’s provocation is “different” this time, and “in another category” regarding the fury it has raised, also among the public. Solberg’s problem is that this time, the fury isn’t directed just at Listhaug but at Solberg and her government itself, over its apparent inability to put Listhaug in her place. 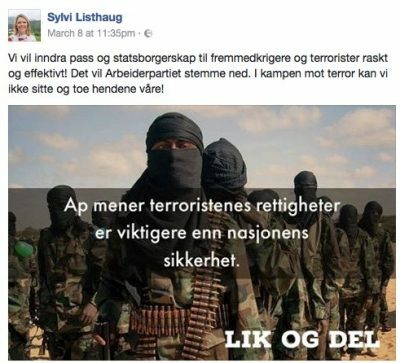 The latest trouble began last week, when Listhaug accused the Labour Party, on her Facebook page, of allegedly putting the rights of suspected terrorists above the interests of national security. Listhaug, who hates to admit defeat, was reacting to just that after Labour joined a majority in Parliament that rejected her justice ministry’s proposal to strip Norwegian foreign warriors of their passports without court approval. The leaders of all the opposition parties in Parliament also reacted quickly, distancing themselves from what amounted to an attack on Labour that they viewed as outrageous. And then public outrage took over, as Listhaug’s post was shared and “liked.” Labour has, after all, been the target and victim of a terrorist attack itself, when scores of its youngest members were gunned down and killed by an ultra-right-wing mass murderer (and former Progress Party member) on July 22, 2011 who also bombed the Norwegian government’s headquarters in Oslo. Norway’s government was led by Labour at the time. Støre had been among the first to react to Listhaug’s Facebook message, calling it “a gross claim against a party that has experienced a terrorist attack itself.” He went on to note that Listhaug’s attack was not only wrong but that it was hurtful and upset many people who experienced the horrors of July 22, 2011. He demanded an immediate apology from Listhaug. That was like pouring oil on the flames, and then Sanner himself became a target of public fury during the weekend in addition to Listhaug. “I feel like you’re spitting on me,” wrote Tarjei Jensen Bech, who survived the July 22 attack and is now taking over as county governor for Labour in Finnmark. Helen Ingrid Andreassen, another survivor of the massacre on Utøya carried out by the Norwegian right-wing extremist, wrote that Sanner should “stay away from memorial ceremonies from now on,” adding that “when I was swimming for my life (away from Utøya), and being shot after,” she wasn’t exactly thinking that the experience would be good to use politically in the future. As of Tuesday afternoon there had still been no apology from Listhaug, and her Facebook post had not been removed. Calls reached fever pitch for Solberg to reprimand Listhaug and demand an apology. 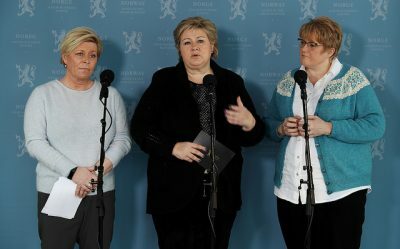 Instead Solberg initially avoided comment, refused to criticize Listhaug and then dismissed the uproar as a conflict between the Progress Party and the Labour Party that they needed to deal with themselves. By Sunday evening, however, Solberg was clearly feeling the pressure. 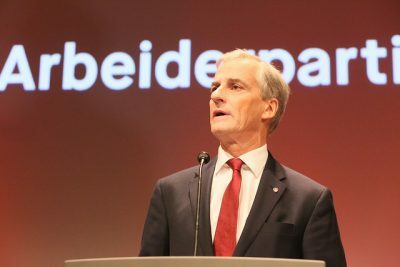 Several of her own Conservative Party politicians and Members of Parliament, including former Education Minister Henrik Asheim, also started demanding an apology from Listhaug. Solberg told Norwegian Broadcasting (NRK) live on national TV that Listhaug’s Facebook post was “too tough” and not in line with professional political debate. “I think that rhetoric often overshadows political content, and I think that’s what’s happened in this case,” Solberg said. Asked whether she would ask Listhaug to apologize and remove her offensive Facebook post, Solberg responded that “Sylvi knows what I think about this case. I think ministers should be careful about their choice of words, but it’s not just Sylvi who uses hard words in politics.” She stopped short of demanding an apology from her justice minister. By Monday Solberg was facing remarks from the leader of the Labour’s youth organization AUF, many of whose members were killed in the July 22 attacks, that she likely would not be invited back to Utøya again. Støre claimed Solberg was now “a complete coward” for not clamping down on Listhaug, who continued to refuse comment or apologize as budget talks got underway Monday. Jensen initially had declined comment during the weekend on the grounds she “was at a party on Saturday and not updated,” referring further questions to Listhaug to refused to answer them. There’s been little if any mention of what the conservative Progress Party thinks should be done to protect Norwegians from ultra-conservative right-wing extremists like the young Norwegian who killed 77 people on July 22, 2011. Ironically enough, anti-terror experts told newspaper Dagsavisen on Tuesday that Listhaug’s defeated proposal likely wouldn’t have had much effect on stopping terrorism and might instead prompt more radicalization. Norway’s police intelligence agency PST estimated maybe “five to 10” potential terrorists might be stopped by having their Norwegian passports revoked. There’s no question that Listhaug causes problems for Solberg’s minority government coalition. There were reports Tuesday that Solberg and Listhaug quarreled at a recent lunch meeting, while other ministers have little if any respect for Listhaug. Hareide’s Christian Democrats, who could turn Solberg’s coalition into a majority government, are now less likely than ever to join it because of Listhaug. More top politicians among Solberg’s Conservatives have made it clear they don’t want Listhaug to speak for them, increasing the pressure on Solberg to clamp down on her. It won’t help to simply move Listhaug to another, less powerful, ministry than justice. Erna Solberg, who’s been riding high in the polls, is suddenly left to appear indecisive and unable to control her own justice minister, just as she’s also faced severe criticism over her support for her party’s president of the Parliament, Olemic Thommessen, who was forced to resign last week. After more than four years of being viewed as firmly in control of her government, questions are rising over the judgment and leadership of Solberg, Jensen and, not least, Listhaug. Commentators agreed on NRK’s morning radio debate program Tuesday that Solberg and her party colleagues underestimated the revolt against Thommessen and now against Listhaug. In the meantime, her state budget talks were utterly overshadowed by all the political intrigue, and quarreling that’s surely going on in Hurdal this week, behind closed doors.